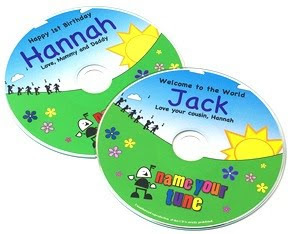 Name Your Tune is a Canadian-based company that includes your child’s name over 80 times in 14 different favorite kids songs. Name Your Tune sent me a personalized CD with Baby Bird’s name on it. When ordering the CD, they ask that you both spell out their name, and spell it phonetically, or to sound it out. Kind of like spelling Baby Bird, then phonetically spelling it as ‘Bay-bee Bird’. Our daughters name can be pronounced a couple of ways, but they got it bang on! And it sounds so good to hear it in the songs. We first put the CD on when Baby Bird was playing, and she started to dance to the music. She was so excited to be dancing, she never noticed her name during the first song. But then the second song came on and it went like this… “If you’re happy and you know it, clap your hands. If you’re Baby Bird and you know it clap your hands.” Each time she heard her name during that song she stopped dancing (and clapping her hands) briefly and looked at the stereo. It was just so cute. Name Your Tune will also personalize the actual CD. We had ours read “Happy 2nd Christmas Baby Bird, Love always Mommy and Daddy”. The songs are very well sung and you can definitely make out Baby Bird’s name throughout. I love all of the songs on this CD. They are popular so I can sing along with them too. You can get a complete playlist of the songs on the CD and you can click to listen to them on their site. This is a fantastic gift for any young child. The most fun is watching someone who is just learning their name when the CD is playing. Seeing the look of faint recognition is so adorable. 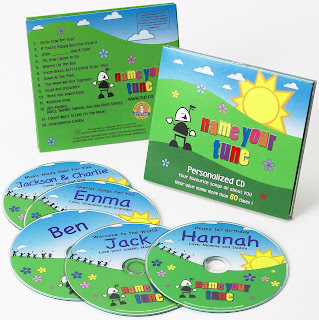 The Name Your Tune Personalized CD has made it to our Christmas shopping list this year as we have someone who this will be perfect for and will be placing an order shortly. The Name Your Tune CDs sell for $20CAD on their website. A portion from the sale of each Personalized CD is donated to Hear Here, a Toronto-based non-profit organization that provides hearing aids for children. After you check it out let me know what your favourite song on the CD is. my favorite song on the cd is hello, how are you? I love Boom Boom Ain't It Great to be You! I can only get a CD for one of my kids (because of name selection) but that's okay. Weels on the Bus – had to go for a classic! The wheels on the bus! My son would love this! My favorite (and my daughter's) is Head and Shoulders. Signed up for Name Your Tune's mailing list. If You're Happy and You Know It is so cute! Well, my fave is if you're happy…because my dtr gets sooo excited and as soon as I start singing it she starts clapping and stomping her feet at the same time!! Our 2nd fave would be the abc song, when she was just a little baby she would calm as soon as we started singing it and when she got a bit older it always made her smile. I love the "Boom Boom Ain't it Great to be You" song. Our favourite song is "There are Seven Days"
My favorite song would be:If You're Happy And You Know It! Our favorite is probably If your happy and you know it! "if you're happy and you know it" always makes the children smile and sing along so I like it. My fave is Boom Boom Ain't it Great to Be You! I love Wheels on the Bus, I have so many good childhood memories with that song!! My favorite sone would be "Boom Boom ain't it great to be You"
My favourite would have to be 'Old Macdonald", it's my daughter's favourite song. wheels on the bus is the fav in our house – we can sing it forever! Head and shoulders, definitely is my fav song. Well, my daughter's anyways. I love watching her dance to it!! My favorite is "Boom Boom, Ain't It Great To Be YOU!" Wheels on the Bus! We sing this in my sons swim class and he loves it! My fav is Wheels on the Bus..so catchy! Wheels on the Bus – a classic! Okay, I like all the songs but my fav would have to be "boom boom, aint it great to be YOU!" This isn't my pick, it is my son's… Old MacDonald. He sings it all day. Some times for hours at a time. Maybe if I had the CD when the song was over he would switch to the next one???? Maybe?????? ?